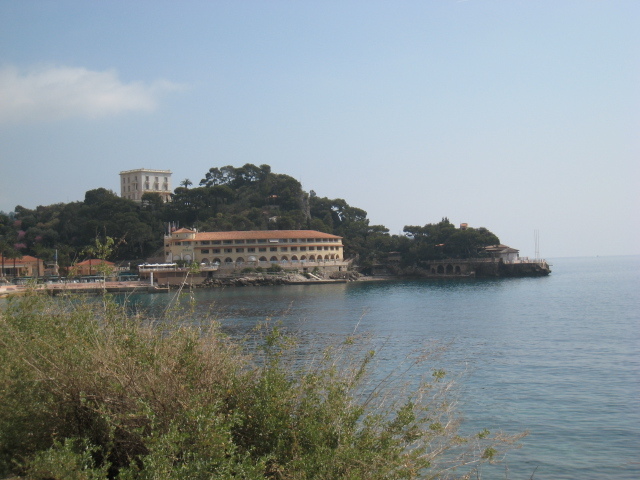 This is the Monte Carlo Beach Hotel which is actually in France! Yes, Monaco leases the land from France. The restaurant on the point is called La Vigie, which, as you can imagine, has amazing views as you dine on the terrace under the trees. My neighbour's husband, a lovely old boy called Daniel, who sadly died a few years ago, used to work at La Vigie. He worked on the speed boats as they arrived with the lunch or dinner guests - helping visitors to disembark and generally doing whatever boat people do. He was a lovely man, born in Algeria - he left school at 13 when his first job was to lay sardines out to dry in the sun. Daniel's work always involved the sea. He told me he made very good tips in his work at La Vigie. The tall building you see in the background belonged to the designer, Karl Lagerfeld, until he sold it to the SBM (Société des Bains de Mer) - the company that IS Monaco - ie owns the casinos, hotels, restaurants etc. Me too, and sounds like working there isn't so bad either! Have a great weekend!